Renault have introduced another new front wing. Fernando Alonso tested it on and off during Friday and Saturday free practices before deciding to use it in qualifying and the race. This time it consisted only of a minor adjustment, but considering its position it may well have an interesting influence on the airflow further downstream. 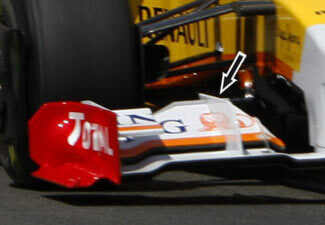 The team added a vertical split panel on top of the wing, approximately where Brawn and BMW have similar items. Renault's version is however only for aerodynamic purposes and does not house the front flap adjuster system. @imightbewrong: I stand corrected. Post changed accordingly.